The spores of black mold, like other molds, grow naturally both indoors and outdoors. Mold gets indoors, into your home, via a variety of means. They can enter through open doors and windows. They can get in by way of the outdoor air intake of a heating, ventilating, and/or air-conditioning system. They can also attach themselves to you, your family members, your visitors, and your pets when you or they are outdoors, then “hitch a ride” inside. As well they will attach themselves to your clothing, your shoes, or the shopping bags you are carrying. Molds are opportunists—they find many ways to get into your home despite the fact that you don’t want them. Mold will not typically grow well in a dry environment. Molds need moisture. When they find it, though, they will proliferate like mad. You may have moisture in places you haven’t even thought of…like the underdish of a plant pot that collects excess water when the plant has been watered. Other typical suspect environments include roofs, pipes, walls, or anywhere there has been flooding. Construction materials are hospitable to molds, as are wet cellulose products, such as paper and cardboard; also ceiling tiles, wood, and wood products. While those are among the most hospitable, dust, paints, wallpaper, insulation materials, drywall, carpet, fabric, and upholstery, also encourage mold growth. How do you know black mold when you see it? 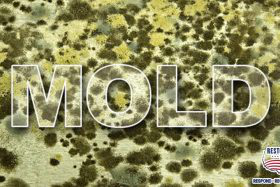 Differentiating black mold from other molds is best left to the experts, whom you will need to call anyhow to rid your house of the mold, whatever the type. That said, however, so-called “black mold” actually is greenish-black. It requires a lot of moisture to grow, and if you are able to remediate the dampness situation—that is, if it does not require professional intervention, such as to address the mop-up after a major flood or to stop a water leak—that’s the first step you should take. Then you need to call a mold specialist to rid your home of the mold. If you are experiencing nasal stuffiness, eye irritation, wheezing, or skin irritation, consider that it may be a reaction to black mold. Unfortunately, not all reactions are relatively benign like those. You or a family member could also experience fever and shortness of breath, fungal infections in the lungs (especially in people with compromised immune systems or chronic lung diseases such as COPD). The range of symptoms, in fact, is quite broad and includes problems affecting most parts of the body, from the genito-urinary complex to the gastrointestinal tract right up to the brain. The fetus of a pregnant woman is at risk if she is exposed. Black mold is indeed an unwanted “guest”! HOW INFORMED ARE YOU ABOUT BLACK MOLD? Although black mold (and its mold “cousins”) are hazardous to virtually every part of the body, the upper respiratory tract, which is where the mold’s toxins most commonly enter the body, is the most likely part to first display symptoms. Cold-like symptoms (runny or stuffy nose), cough, and wheezing might occur in people who, except for the mold issue, are perfectly healthy. Asthma symptoms can occur in people with asthma. And hypersensitivity pneumonitis can beset persons susceptible to that condition. Unfortunately, however, the list doesn’t stop there. Its poisons, which are called mycotoxins, can literally kill (people and animals, too—consider black mold as a possible cause if your pet develops symptoms and your house has been damp, and mention it to your veterinarian). In between giving you the sniffles and causing you to lose your life, there are a variety of symptoms affecting virtually every part of the body. These range from brain fog to impotence, from fever to diarrhea. Besides being hazardous to you and your family members, black mold is hazardous to your house itself. It can destroy walls, flooring, ceilings, and more. It feeds on the various surfaces it attaches to and, as it grows, it erodes the surface. It can literally make a house uninhabitable. Black mold can create dry rot in the wooden beams of a building, rendering it no longer able to support the structure. As well as growing on walls and other obvious surfaces, black mold can also grow where it cannot be seen. It can proliferate behind walls and under flooring, doing much damage before you ever realize that it has invaded your home. The components of your house are not the only inanimte objects at risk. For example, if you hang a leather jacket in a humid closet, the mold can eat at the leather and ruin the jacket. As mold in a building grows and proliferates, the degree of contamination will worsen, and the more mold there is, the more toxins, hence the greater danger to the home’s inhabitants. Mold cannot be removed from building materials. The materials will have to be torn out and replaced. This is done by qualified mold remediators wearing hazmat suits, which should give you an idea of how seriously the professionals take the threat of mold. Toxic Black Mold Fix a plumbing leak quick & easy.